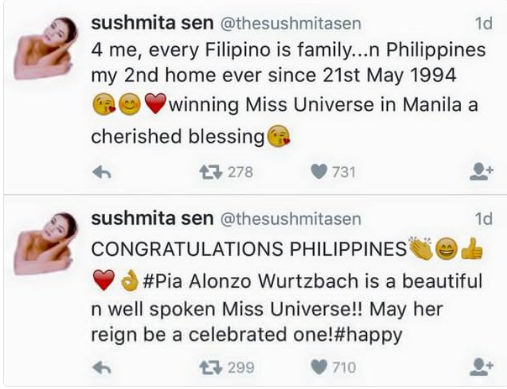 The last time that Philippines hosted the pageant was in 1994 when then Miss Universe Dayanara Torres passed the crown to Sushmita Sen. According to reports on TV Patrol, Miss Universe Organization has invited two of the most loved Miss Universe of the Filipinos- Dayanara Torres and Sushmita Sen to attend the 65th miss Universe pageant to be held on January 30, 2017 in Manila, Philippines. Miss Universe 1993 from Puerto Rico Dayanara Torres, who captured the hearts of Filipino fans in her more than five years entertainment stint in Manila, is one of the original hosts at ABS-CBN's Sunday variety show "ASAP". She also starred in movies with her ex boyfriend Aga Muhlach and Cesar Montano, among others. Sushmita Sen, the first Indian Miss Universe winner, became popular among Filipinos after she won the crown which was held in the Philippines in 1994.
Who could not forget her memorable answer during the 1994 pageant? “For me, every Filipino is family…and Philippines (is) my 2nd home ever since 21st May 1994. 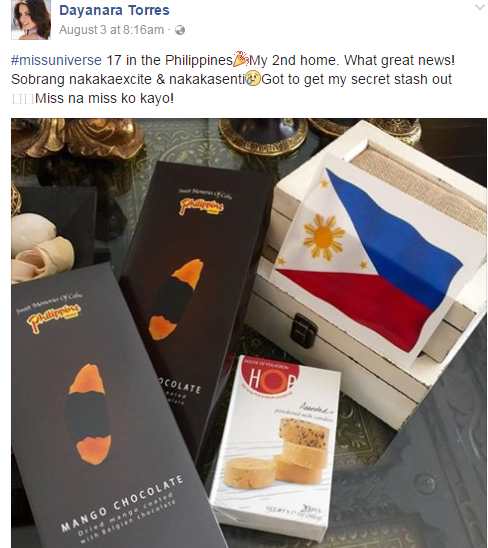 Winning Miss Universe in Manila (is) a cherished blessing,” she added. We miss you both! We just can't wait for you to arrive here in the Philippines next year! READ ALSO : Miss U Org. Increases Candidates' Age Requirement from 27- 28 Years Old!